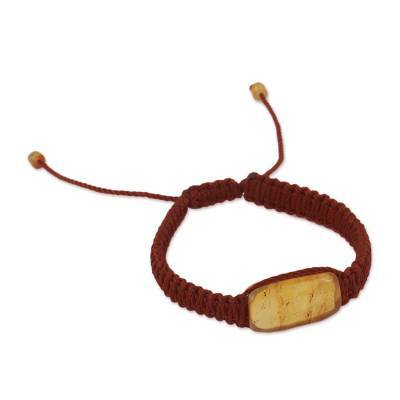 Amber Pendant Bracelet in Brown from Mexico, "Ancient Desire in Brown"
Circling the wrist with hand-knotted macrame cord in brown, this unisex bracelet from Mexico is designed by artisan duo Jacqueline and Eddy. This impressive accessory is centered by a pendant of amber, gleaming with ancient beauty. A sliding knot gives this bracelet an adjustable length. Petite amber accents dangle from the clasp. You can find amber pendant bracelet 'Ancient Desire in Brown' by Jacqueline and Eddy in jewelry categories such as Amber Bracelets, Nylon Bracelets, Macrame Bracelets and Pendant Bracelets. Enjoy exploring these sections for other Novica treasures.